The Sargasso Sea in the North Atlantic is bounded by the Gulf Stream on the west, the North Atlantic Current on the north, the Canary Current on the east, and the North Equatorial Current on the south. The Sargasso Sea is a region in the gyre in the middle of the North Atlantic Ocean. It is bounded on the west by the Gulf Stream; on the north, by the North Atlantic Current; on the east, by the Canary Current; and on the south, by the North Atlantic Equatorial Current. 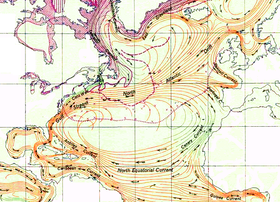 This system of ocean currents forms the North Atlantic Gyre. All the currents deposit the marine plants and garbage they carry into this sea. The Sargasso Sea is 700 statute miles wide and 2,000 statute miles long (1,100 km wide and 3,200 km long). Bermuda is near the western fringes of the sea. The Sargasso Sea is the only "sea" without shores. The ocean water in the Sargasso Sea is different for its deep blue color and exceptional clarity. Underwater visibility is up to 200 feet (61 m). Portuguese sailors were among the first to discover this region in the 15th century. They named it after the Sargassum seaweed growing there. The Sargasso Sea plays a major role in the migration of the European eel and the American eel. The larvae of both species hatch there and go to Europe or the East Coast of North America. Later in life, they try to return to the Sargasso Sea to lay eggs. It is also believed that after hatching, young Loggerhead Sea Turtles use currents, such as the Gulf Stream to travel to the Sargasso Sea, where they use the Sargassum as cover from predation until they are mature. ↑ "Flint Institute of Arts Vol 2 No 2" (PDF). ↑ "Sargasso Sea". World Book. 15. Field Enterprises. 1958. ↑ "Wide Sargasso Sea". Book Drum. ↑ "Turtles return home after UK stay". BBC News. 2008-06-30. Retrieved 2010-05-23. This page was last changed on 17 September 2014, at 20:40.